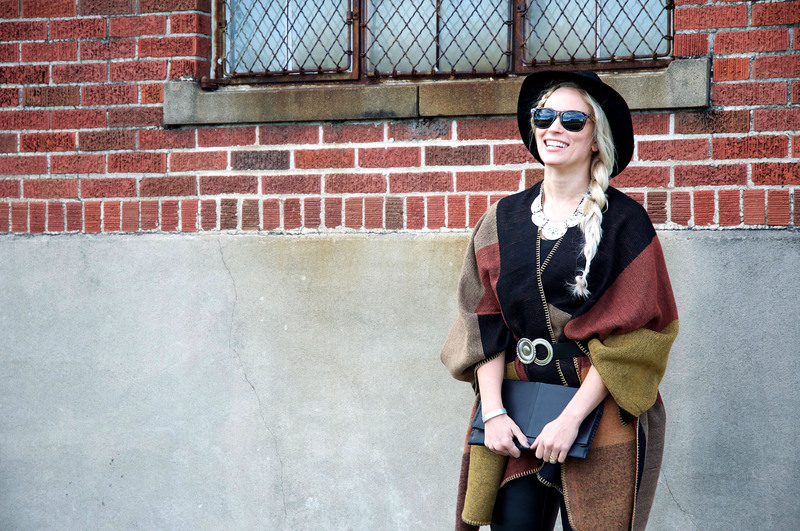 LT Ambassador Shannon dishes on how to wear one of this season’s top trends! You’ve seen it – this trend is everywhere! Gobs of ladies effortlessly sporting their ponchos while they run about town. With a smaller frame and shorter legs, I knew that wearing the blanket poncho without looking overwhelmed would be a challenge. But I was up for the task and after several styling tries, this color block poncho became my favorite November piece from Le Tote! It IS the statement piece! The most important style tip I came to find with the poncho was to keep everything else about your look sleek and minimal. It’s a statement piece and doesn’t need competition. Pairing the poncho with these leather choices in pants, shoes and clutch gave the look some edge but kept it simple. Tights and boots would also be a good look to complement the poncho. And my biggest ally in successfully pulling off this poncho was the belt! It helped hold the poncho on and gave me shape. I think women who are taller and have longer legs can totally pull off the poncho unbelted. But if you have a smaller frame, not belting the poncho, you run the risk of looking like you’re wearing the blanket that hangs over the back of your couch. And that is not a good look on anyone ;). Something I found helpful was to view the poncho as something I would wear to bundle up in outside. With that in mind, a hat made perfect sense to pair with the poncho. Again, remember that the poncho is what will be speaking the loudest. So, remember to keep it sleek and simple as you accessorize.